The air back pad support (BOSU) provides optimal comfort during the execution of movement. The foot platforms are good for both leg raise and dip exercises. Extra 1.5’’/3.7 cm handgrips for dips. Angled forearm pads provide heightened stability and comfort. The BOSU® Storage Cart stores and easily transports up to 14 fully-inflated BOSU® PRO Balance Trainers, while enabling fitness facilities to conserve valuable floor space. The grey cart is constructed of durable steel; has heavy-duty, non-marking casters; and fits through a standard doorway. Balance Trainers not included. BOSU® Ballast® Ball, individuals can perform exercise progressions and dynamic drills that aren't possible on a regular stability ball. 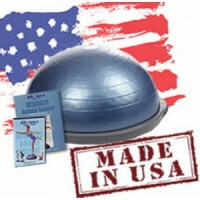 The product is translucent light blue with white multi-dimensional material, and includes a foot pump and workout DVD. Product can be inflated between 55cm and 65 cm, 6.5 lbs. Maximum user weight is 300 lbs. Made in the USA. 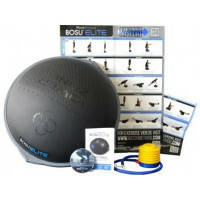 BOSU® Elite, a specially-designed version of the BOSU® Balance Trainer that helps improve athletic speed, power, body mechanics, and balance, and complements new, WeckMethod™ programming. The BOSU® Elite incorporates a higher density dome and targeted training area defined by a “Power Line” and “Power Zone” to establish optimal body mechanics while performing advanced athletic workouts. 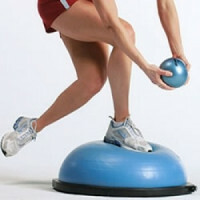 The BOSU® PRO Balance Trainer has a bladder weight of 8 pounds, and a dually over-molded platform for extra strength. It has a smooth, non-skid, non-marking base. The BOSU® PRO Balance Trainer has a blue dome with logo detailing and light grey clamp and platform. Maximum user weight is 300 lbs. BOSU® Soft Fitness Ball – 4 lbs. 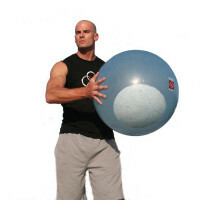 The BOSU® Soft Fitness Ball is designed to be easily gripped in one hand, allowing the user full range of movement. 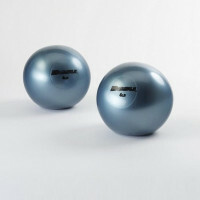 The BOSU® Soft Fitness Ballis easy to hold, soft to the touch and perfectly compliments many exercises performed on the BOSU® Balance Trainer and BOSU® Ballast® Ball.